BCRA would remove mental health care coverage, a critical piece of solving the opioid crisis. Want to Curb the Opioid Epidemic? Don’t Limit Access to Health Care. Offering affordable mental health care coverage is one of the best ways to prevent or address addiction. The Republicans’ ACA replacement takes that away. 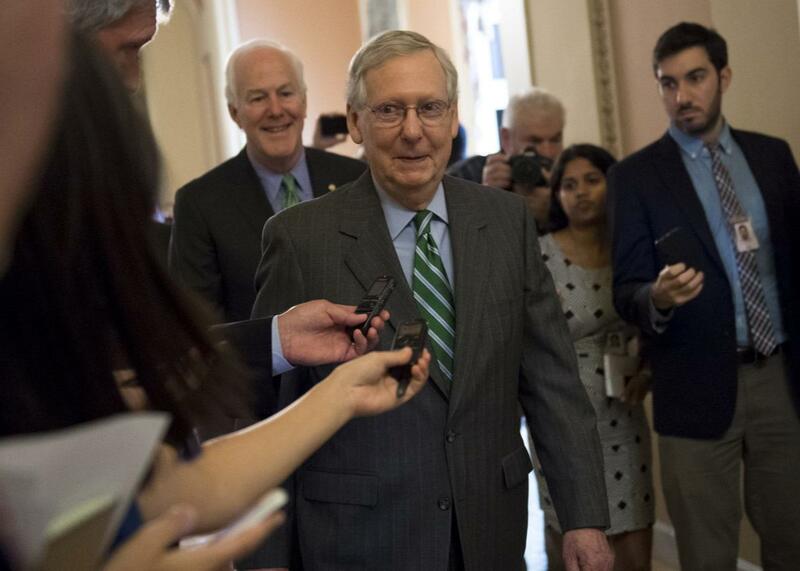 Senate Majority Leader Mitch McConnell walks through the Capitol in Washington on Friday, following the release of a draft of the Senate GOP’s health care bill. I am an addict. Without my medications for depression and anxiety, I will relapse. I’m not homeless. I’m not a junkie. I’m not a rock star. I’m a 40-year-old suburban stay-at-home mom. A recent Atlantic article posits that opioid addiction is exacerbated by depression. It cites recent research suggesting that depressed people are more likely to continue using opioids for longer periods of time, even after their physical pain has subsided. In my experience that was absolutely true—I became addicted to opioids to mask my undiagnosed postpartum depression and anxiety. It doesn’t seem possible, but even though I was suicidal after the birth of my son, I didn’t realize I was depressed. I knew I was in a dark place, but I didn’t have the words to explain how I felt. I knew antidepressants were available, but I didn’t know how to talk about them or access them. I was searching for anything to remind me of my old self, to remind me that life was worth living. I found it via opioids. My addiction to opioids began in an all too common way: I was prescribed painkillers because I had a pain problem. When I began taking Percocet to help alleviate my endometriosis pain, it was as if everything in my life shifted into focus. Previously, I had felt like a character in an antidepressant commercial—pursued by a dark cloud, centered solely upon me. I thought I would never escape its grip. But opioids helped clear a path through those clouds. The fog began to dissipate. I felt better, not cured, but good enough. I had unintentionally found a solution to my emotional as well as physical pain by self-medicating. Immediately, I began taking Percocet and other opioids daily, regardless of my pain level. I was able to care for myself and my young son because the pills didn’t affect me like alcohol or other drugs. I wasn’t drunk or high; I was a relaxed, looser version of myself. I was shocked when I realized I had gone from taking pills to being addicted to pills. But no one is immune to addiction—not even moms. The National Institute on Drug Abuse reports that more than 2 million adults in the United States were addicted to prescription painkillers in 2014. In 2015, 33,000 people died due to opioid overdoses, more than any other year on record. Opioid-related deaths have risen sharply since 2000, a trend I’m worried will continue. Still, fighting this epidemic is one of the few things that unites people across the political divide these days. In fact, Sens. John McCain and Kirsten Gillibrand have introduced bipartisan legislation to prevent overprescribing for acute pain, one attempt to limit the scope of the problem. And yet, the Better Care Reconciliation Act, the reworked version of the American Health Care Act currently waiting for a vote in the Senate, is poised to allow insurers to stop covering care for the mental health problems that often lead to addiction. This could make coverage excessively expensive. It would make it harder for these people to access the right health care that could help them and protect them from addiction. Like many people who end up self-medicating, I didn’t know how to properly manage my mental health issues without assistance from my doctor. Instead, I found a quick fix through substances that eventually exacerbated my problems. Depression, anxiety, bipolar disorder, obsessive compulsive disorder, schizophrenia—these can all put people at higher risk of addiction if not properly diagnosed and treated. There may not be cures for these diseases, but a comprehensive medical plan, including therapy and appropriate medication, can help people who have them lead normal lives. I was able to overcome my addiction and have maintained my sobriety with my psychiatrist’s help. I am lucky: My insurance covers a substantial portion of my medications, making them affordable. In addition to the medications that treat my depression and anxiety, I take Suboxone, a drug that contains buprenorphine and naloxone. Naloxone is an opioid blocker that stops opioids from “sticking” to the pleasure centers in the brain. Even if I take a Percocet or a Vicodin, I won’t feel the effects of the drug (it would also dull the effects of more dangerous drugs such as fentanyl or heroin). Buprenorphine is an opioid, but it doesn’t create the euphoric feelings most opioids produce. It attaches to enough receptors to reduce or even eliminate cravings, and it offers pain relief. It’s one of the most effective ways we know how to treat addiction. For me, Suboxone helps treat my pain and helps me manage my addiction. It’s true that both GOP plans, AHCA and BCRA, motion toward addressing addiction. But the solution—to set aside money for treatment programs—is too little too late. Many experts agree that expanding mental health services is the best way to tackle addiction. Instead, the BCRA slashes those services, removes requirements that would make insurance companies cover mental illnesses, and reduces access to insurance overall. If medicine like antidepressants become prohibitively expensive, people will seek out cheaper solutions. I worry that the cheapest option available nationwide is heroin. Repealing the Affordable Care Act will be a disaster for the millions of people who have both mental illness and addiction. Without antidepressants, anti-anxiety drugs, mood stabilizers, psychiatrists, counseling—without the proper tools we need to succeed—many of us will be at higher risk for addiction. One major part of fixing the opioid crisis is providing affordable mental health care coverage. The BCRA fails at this. If the plan goes into law, it could very well make the opioid crisis in this country substantially worse. When it comes to addiction, there’s one thing we know: Limiting access to health care will likely leave many people out in the cold.